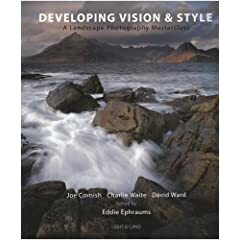 I've just finished reading Developing Vision and Style: A Landscape Photography Masterclass, and I'm not entirely sure what to make of it. Edited by Eddie Ephraums, the book's images are uniformly beautiful and reproduced very well, even in the paperback edition of the book I bought. After a dozen or two images, though, all that uniformity starts to grate. It seems to me that there is a certain sameness to many of the landscapes, and it shows up right on the front cover: rocks in the foreground, dramatic sky, optional body of water. The images that don't follow this formula stand out by comparison. This is a little odd in a book that is meant to be about developing vision and style. Although the authors and other contributors talk at length about their unique visions and styles, there isn't always a lot of uniqueness on display. I was also struck by how little insight was to be gained on the photographers' vision and style: very few were able to articulate what characterized their own work, never mind offer readers useful direction on developing theirs.